The Minnesota Department of Natural Resources (DNR) Invasive Species Program includes a specific program to curb the spread and manage the growth of Eurasian watermilfoil. 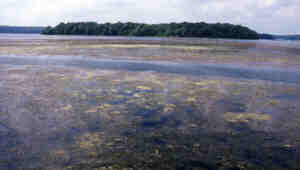 This program monitors the growth of Eurasian water milfoil in the state; reduces the growth of Eurasian watermilfoil in coordination with appropriate local units of government, special purpose districts, and lakeshore associations, including technical assistance; and coordinates cooperative research with the University of Minnesota and other research facilities to study the use of biological control methods and herbicides. Eurasian watermilfoil was first discovered in Minnesota in Lake Minnetonka in 1987. Because of the problems the plant had caused in other states and the fact that it was found in a heavily used recreational lake, the DNR initially undertook aggressive management efforts aimed at eradicating or significantly reducing its abundance. At the end of 2004,Eurasian watermilfoil had been found in 160 lakes, rivers, and streams in Minnesota waters. Details may be found in the infested waters list. Most problems caused by milfoil can be managed with conventional methods such as treatment with herbicides or mechanical removal of plants. The DNR supports management methods that cause as little damage to native aquatic plants as possible. The DNR protects native plants because they provide many benefits to lake ecosystems, such as stabilizing lake sediments, and increasing habitat for fish and wildlife. In addition, widespread destruction of native plants can lead to an overall increase in the amount of Eurasian watermilfoil in a water body because milfoil is very effective at invading disturbed habitat. The DNR's experience using herbicides to eradicate milfoil is consistent with experience elsewhere, which indicates that efforts to eradicate this invasive with herbicides are "...rarely, if ever, likely to succeed" (Smith and Barko 1990). Our experience in attempting to prevent the spread of milfoil within a lake with herbicides is also consistent with the observation by Smith and Barko (1990) that efforts to prevent the spread of milfoil within a lake may slow its expansion, but rarely prevents its dispersion within a lake. The DNR has done research on the potential to use fluridone, an aquatic herbicide, to manage milfoil. The results of an evaluation conducted by the DNR in the mid-1990s and other information available at that time suggested that application of this herbicide to whole lakes or bays at an intermediate rate of 10 parts per billion (ppb) causes unavoidable damage to native vegetation and has the potential to affect other aspects of lake ecosystems (Welling et al 1997). The results of subsequent investigations of fluridone in Michigan suggested that application of the herbicide at the low rate of 5 to 6 ppb may provide more selective control than has previously been observed in Minnesota. In an attempt to reproduce those results in Minnesota, the DNR will subject three Minnesota lakes to experimental whole-lake treatments with fluridone in 2002. The results of these treatments will help guide our approach to the possible use of this herbicide in the future. Potential cooperators on lakes with a public water access, which have widespread Eurasian watermilfoil, may apply to the DNR for grants to support efforts to manage milfoil. The goals of this grant program are to reduce nuisances caused by Eurasian watermilfoil and to slow the spread of the invasive to other lakes. Management done with State funds usually involves control of Eurasian watermilfoil in areas that are located either off-shore or near public water accesses. These areas are commonly used by the general public, as opposed to near shore areas adjacent to privately owned property, which are used primarily, if not exclusively, by owners of that property. This grant program is described in the Minnesota Department of Natural Resources Financial Assistance Directory. Since 1992 the State of Minnesota has funded research into potential insect biological control agents for Eurasian watermilfoil. Work has been primarily focused on a weevil (Euhrychiopsis lecontei), which is a native insect. Declines of Eurasian watermilfoil in some lakes have been associated with weevils. Unfortunately, other lakes with weevils have not experienced declines in Eurasian watermilfoil. Current research is focused on attempts to determine what factors or conditions limit the abundance of weevils and prevent the insects from controlling milfoil. Much of this research has been done at the University of Minnesota by Dr. Ray Newman and his colleagues. Information about his work is available on his Biological Control of Eurasian Watermilfoil web site. The use of biological control agents to reduce Eurasian watermilfoil could minimize the need to use herbicides. Nevertheless, experience has shown that development of biological controls may require research conducted over a period of ten years or more. Consequently, the Invasive Species Program's evaluation of the potential for biological control of Eurasian watermilfoil is considered to be a long-term effort, the outcome of which cannot be guaranteed.